(Sold) This is a White Dot Sheaffer Snorkel Statesman fountain pen in Black, with a palladium-silver Fine Triumph nib. The pen has been restored, which included a complete disassembly, a gentle cleaning, an overhaul of the filling mechanism, ink flow adjustment, a nib tune-up, and a gentle polish with a soft cloth. The Sheaffer Snorkel is broadly considered one of the most advanced fountain pens ever built. Most fountain pen enthusiasts are familiar with the meaning of the term "Snorkel" so I will spare you the story. However, what a lot of people are not aware of is that a well-restored, well-tuned Snorkel is a phenomenal writer. In my opinion, the Snorkel is among some of the best performing fountain pens I've ever used, vintage or modern. The filling mechanism is easy to use and downright fun, but it is the nib (a nib and feed system, really) that really takes the cake. So what makes it such a great writer? First of all, the ergonomics. It seems like such a simple thing, really, yet time and time again, pen designers get ergonomics wrong. Not at Sheaffer's! The Snorkel has a gently streamlined shape, a long, slightly textured section, not appreciable step-down, and excellent balance, posted or not. The ink delivery system is rather complex in terms of engineering, but what's important to us, writers, is that the overall surface area of the ebonite material that makes contact with the ink is massive, especially for a pen of this size. A large surface area means an excellent ink buffering capability. Regardless of atmospheric conditions, your writing technique, the paper or the ink used, the pen delivers a generous, yet controlled and consistent flow of ink. Again, a feature that many pen designers often get wrong. Once the ink reaches the nib, the real magic happens. The Triumph nib is made of palladium-silver, an alloy very similar to that used by Visconti on most of their high-end "Dreamtouch" nibs. the alloy is similar to gold in both its fluid dynamics and vibration dampening properties. As a result, you're getting a nib that's both firm and soft. Yeah, I know that sounds like a contradiction, but it really is not. The nib will perform very well both in the hand of an experienced calligrapher and a complete novice. Sheaffer made sure of that by giving the nib a large sweet spot and a slightly upturned tip, which gives you that desirable sensation of smoothness, but without impediment to ink flow. A really ingenious design! Finally, if you need a thinner line, simply flip the nib upside down. On the reverse side, the writing surface is significantly finer, yet without much loss in smoothness or flow. Cosmetically, the pen is in excellent shape! The material has a nice, deep color and a smooth surface. The gold-filled trim is in equally great condition, the imprint is strong. This pen would be a fantastic first "serious" vintage pen for a fountain pen novice, and it would be excellent as a tool for cursive handwriting. It lays down a 0.4 mm line (on my paper), and it sold as Fine, though, by today's standards, it close to a Western XF (e.g., as in a Pelikan M800, Montblanc LeGrand, etc.). (Sold) This is a c. 1942 White Dot Sheaffer Triumph Vac-filler Clipless in striated Golden Brown celluloid, with a 14k gold, two-tone Triumph Lifetime XF nib. The pen has been restored, which included a complete disassembly, a thorough cleaning, an overhaul of the filling mechanism, ink flow adjustment, a nib tune-up, and a gentle polish with a soft cloth (by hand). Sheaffer Triumph Vac Clipless, Golden Brown, XF, uncapped, with the plunger partially extended. I've written at length about Sheaffer's wartime design and engineering capabilities, and I hope I've been able to show that the Iowa company truly was one of the leaders of the pen industry. Sheaffer can be credited with a number of significant innovations in the area of fountain pen design, and even if some of these innovations were not entirely Sheaffer's original ideas, it was Sheaffer who was responsible for implementing and popularizing such features. This particular pen is the epitome of Sheaffer's "progressive engineering and watch-like precision." A pen that is as beautiful as it is functional, this feature-rich writing instrument is likely to give its user the performance they seek while also being a source of endless joy. For me, personally, the Triumph is the ultimate fountain pen, where every bit of the design has a functional role to play. The beauty of the striated celluloid, the semi-transparent barrel, the vacuum filling mechanism, the quarter-turn cap threads, the slightly tapered, comfortable section, the incredible balance (posted or not), and the incredibly precise, dependable, and consistent Triumph nib and feed system. Man, you gotta love this pen! The pen I'm offering today is in excellent condition, with a vibrant, warm-to-the-touch celluloid and excellent gold-filled trim. The imprint is strong, the vacuum filling mechanism efficient, and the clipless cap adds quite a bit of character to this pen. The Triumph nib is a rare nib that is as suitable for highly skilled penmen as it is to absolute beginners. An XF writer, the nib lays down a line of about 0.4 mm (on my paper) under the lightest touch. It does so without ever catching the paper or refusing to write, regardless of the direction and rapidity of your strokes. Better still, it has the beginner-friendly properties of having a large sweet spot and writing equally well with a heavy hand. Ink flow is generous, and, most importantly, consistent, thanks to the oversize ebonite feed's excellent buffering capability. The pen is priced at $129. Please, let me know if you're interested in ordering it and I will email you a PayPal invoice. Shipping fees are listed on this page. Thanks! 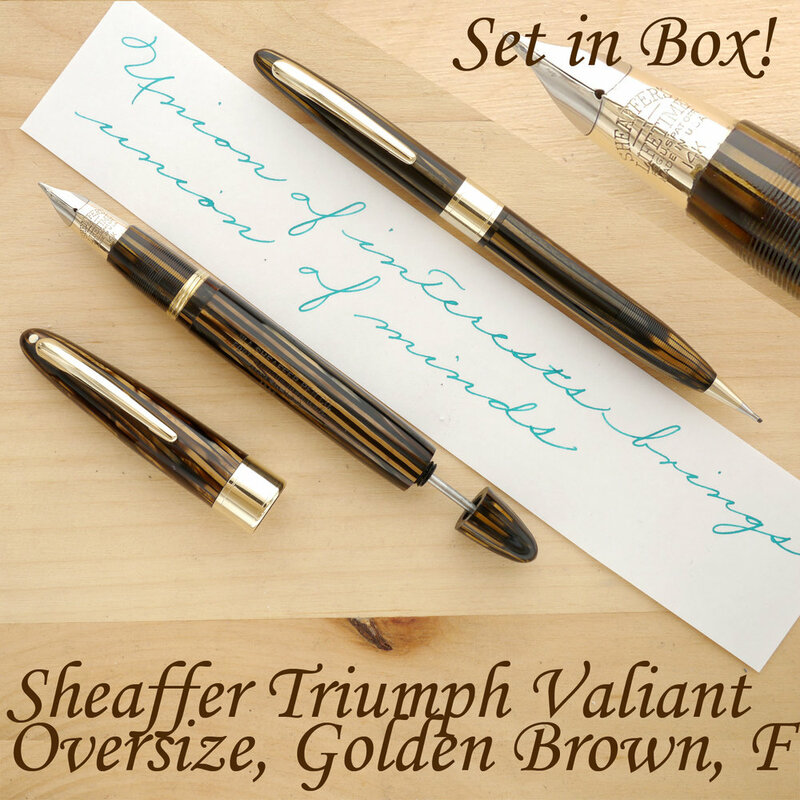 (On Hold) This is a 1942 White Dot Sheaffer Triumph Vac-filler fountain pen and mechanical pencil set in striated, semi-transparent Black celluloid, with a 14k gold, two-tone Triumph Lifetime Fine nib. The pen has been restored, which included a complete disassembly, a gentle cleaning, an overhaul of the filling mechanism, ink flow adjustment, a nib tune-up, and a gentle polish with a soft cloth. The pencil has also been restored to full functional and cosmetic condition. The set comes in the original box, also in great condition. In the 1940s, as the U.S., joined World War II, the fountain pen industry was faced with severe material shortages (including rationing), labor shortages, and a difficult economic and political climate. In addition, Sheaffer was tasked by the U.S. Government with the manufacturing of high-precision armament components, such as bomb fuses, testament to the Iowa company's superior technological prowess. 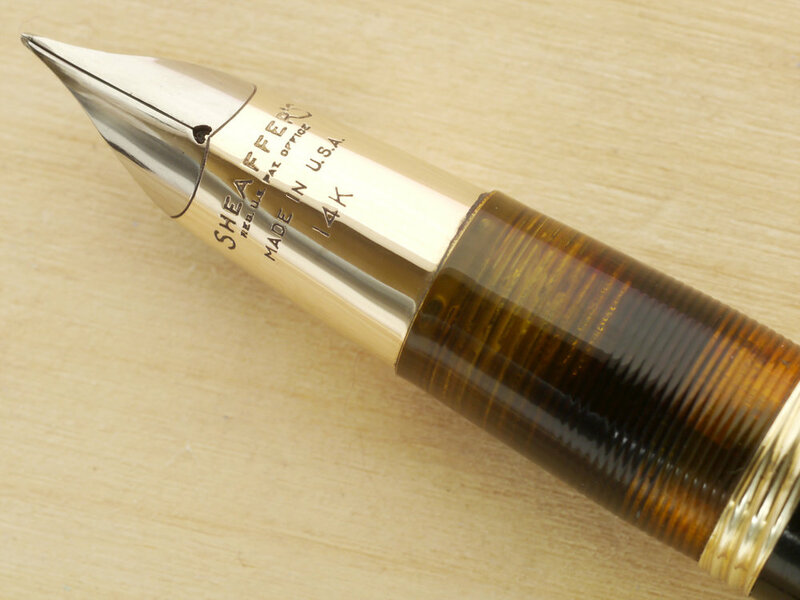 Despite all that, Sheaffer came up with one of its most successful fountain pens ever, the Triumph vacuum filler. The set I'm offering today is a superb example of the Triumph. Made of Black celluloid, with a semi-transparent barrel, a wide gold-filled band, and vested with a phenomenal Triumph nib, the pen is a beautiful writing instrument, capable of incredible performance. The filling mechanism, which has just been completely rebuilt, works efficiently and holds a lot of ink. The nib writes an utterly enjoyable Fine line of about 0.5 mm (on my paper) that is smooth and consistent. The genius of the Triumph nib is that it feels smooth regardless of (reasonable) variations in holding angle and rotation about the page. The nib has a large "sweet spot," which allows its user to write rapid strokes in all directions, without ever skipping, skidding, or catching the paper. The oversize ebonite feed provides generous, yet controlled flow that will never run dry. The pen and pencil set would make a great gift; it even comes in the original box. Why not consider it as a Christmas present for a family member or a friend? I think it would be a more interesting and original gift than even the latest and greatest electronic gadget.